Using a whisk, combine the cream and all the other ingredients in a pan, bring to the boil over a medium heat, stirring constantly, and continue to simmer, stirring, until the mixture is creamy. Remove the pan from the hob, continue to stir for about another 2 mins. Push the crème through a sieve into a small bowl, divide among the ramekins, leave to cool completely, cover and place in the fridge for approx. 2 hrs. until set. Arrange the bananas on the crème, in a fan shape. 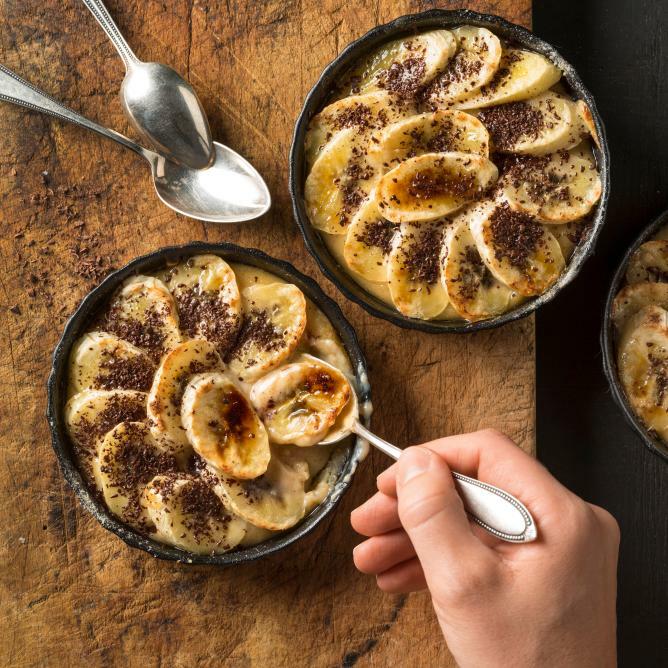 Distribute 1 tablespoon of sugar evenly over the bananas in each ramekin. Caramelize with a blow torch and scatter the chocolate on top. Prepare the crème one day in advance, cover and keep in the fridge. Just before serving, top with the bananas and sugar and caramelize.